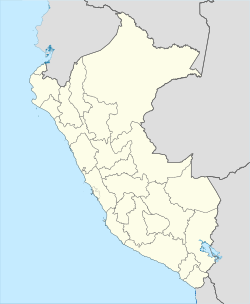 Andahuaylas (Quechua Antawaylla, anta copper, waylla meadow, "copper meadow") is a Peruvian city. It is the capital of the Andahuaylas Province in the Apurímac Region. It is known as the pradera de los celajes (Spanish for "prairie of colored clouds"). Its approximate population of 42,268 inhabitants (2017 census) makes it the first largest city in the region. Andahuaylas is served by its own airport, the Andahuaylas Airport. Wikivoyage has a travel guide for Andahuaylas. This Apurímac Region geography article is a stub. You can help Wikipedia by expanding it.